Like the proverbial phoenix from the ashes, if there were any questions about Ben Affleck's cinematic rebirth, they've been quashed with the arrival of the exquisitely crafted Argo. The impeccably paced political thriller affirms the fact that Affleck is a towering force behind the lens. The forgotten tale of the zany-but-true extraction attempt of six U.S. diplomats days after the 1979 Iranian hostage crisis, is Exhibit A that truth is indeed stranger than fiction. 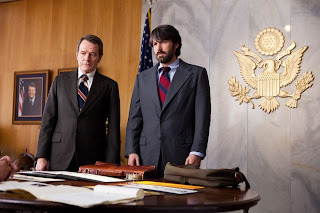 Affleck plays Tony Mendez, a CIA "exfiltration specialist" tasked with getting the sixsome out of the Ayatollah Knomeini-controlled country sans the use of force. With the horde holed up Julian Assange-style in the Canadian embassy and time ticking until their escape is uncovered, Mendez and his CIA cohorts race through randomly hatched plots to get the group to freedom. Pedal to Turkey on bikes? Pose as crop inspectors? English language teachers? Or try this: Create a fake film and send Mendez into Iran as the producer of the project to sneak the six back out with him under the guise that they're part of the film's crew. As Mendez' co-worker Jack (an Oscar-caliber Bryan Cranston) puts it to his superiors: "It's the best bad idea we have". Off to L.A. goes Mendez as he rounds up a makeup master (John Goodman) and past-his-due-date producer (Alan Arkin) to concoct the appearance of a viable production, lest the Iranians question its validity. And thus the titular Argo is born, replete with cheesy '70s sci-fi poster and full page ads in the Hollywood trades. A ridiculously outlandish script read with all manner of Star Wars castoffs bears the film's memorable foul-mouthed catchphrase uttered by Arkin and revisited throughout. Mendez' trip overseas to Iran (Istanbul, Turkey in reality) ushers in the noose-tightening third act. Mendez jumping diplomatic hurdles and trying to sell the crackpot faux film concept to the hesitant-to-be-executed, in-seclusion sextet. While tweaks to the timeline of actual events were clearly made to produce a leaner, meaner, more tension-filled climax, Affleck succeeds in spades, delivering a pitch-perfect, heart-palpitating conclusion to the proceedings. Performances are stellar across the board, from Goodman to Cranston to a low-key Affleck, there's not a weak link in the bunch. But it's Arkin that steals every scene he's in, the now 78-year-old is riotous; the early leader in the clubhouse for best supporting actor. Opening with a Cliff's Notes, graphic novel-splashed history of Iran, Affleck slaps a super-slick look on Argo. His maturation as a director is notably discernible; tying together three distinct, varied locales into a cohesive narrative is a difficult feat for the most noted of camera helmers. Tacking on a Warner Brothers logo circa 1979 in front of the film opens up the affair with flair, it's not too often a smattering of applause breaks out in a press screening. My sound advice for Affleck: Clear some extra space on the mantle next to your Good Will Hunting Oscar. It's all but guaranteed to have company come February. No screwy schemes to sneak the stash of trophies out of the Kodak Dolby Theatre will be required, just showing up should suffice.